This page is a guide to finding jobs in Benidorm including a list of job vacancies as well as suggestions on where to find work and what type of vacancies you may expect to find. Make sure to read Simon’s experience of working in Benidorm below, it is essential reading!!! 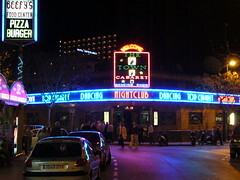 Benidorm is a popular place to find work as it is a busy happening place. Benidorm is the major tourist resort on the northern Costa Blanca in Spain. You can reach Benidorm after a two hour plane ride from most United Kingdom airports. There are three international airports within a ninety minute drive to Benidorm being Valencia, Murcia and Alicante. Benidorm is one of the most popular Spanish towns in which people are looking to find jobs. Being a tourist resort, it has many job openings and vacancies in the catering trades such as cook, waiter, dishwasher, bar tender, cleaner, animators, dancers etc. Many people come to Benidorm for the summer season looking for seasonal bar jobs and you will usually get one pretty easily. Certainly this is the most common type of job available. There are also plenty of other jobs in the tourist sector notably hotel jobs in Benidorm such as holiday reps, cleaners, receptionists etc. Examples of hotels in Benidorm to search for vacancies would be Don Pancho Hotel Benidorm, Dynastic Hotel Benidorm, Flamingo Oasis Hotel Benidorm, Gran Delfin Hotel, Levante Club Hotel Benidorm, Mediterraneo Hotel and Melia Benidorm Hotel. There are also lots of opportunities for summer jobs in Benidorm. It is however important to know that if you do choose to work in the tourist industry that the work is seasonal mainly from March until October and that the wages paid are about 60% of what is earned by your Northern European counterparts, although the cost of living is 90% of that of Northern Europe. A limited knowledge of the Spanish language is ideal but not compulsory, making these kind of jobs fiercely competitive between all nationalities across the board. Very popular on the job scale in this field are cleaning jobs in Benidorm as they are well paid, in abundance and all year round as people’s homes as well as villa companies require cleaners. Work in the tourist industry is mainly done in shifts or split shifts. 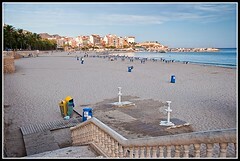 On the positive side you can spend your time off at the beaches of Benidorm such as Playa Poniente or Playa Levante. This line of work also takes its toll on family life and relationships so it is ideally for singles without partners or families as the hours are ad-hoc and long. Jobs in Benidorm can be found by the usual means of internet, radio, newspaper, word of mouth etc. There are a lot of competition for jobs so it is important that you apply for a job with a contract. These kind of jobs will entitle you to the Spanish state pension, a limited unemployment and of course to medical care. As your new employer will also be paying his fair share of these contributions he will make sure he employs the best candidate for the job. Of course there are many other jobs just like anywhere else such as lawyer, doctor, teacher, nurse, policemen, pharmacist, shop assistant, laundromat etc. Working hours differ greatly from Northern Europe due to the extreme heat. A typical Spanish working day starts at ten in the morning until one and then everyone has a siesta. Work resumes at four in the afternoon until around eight in the evening. Most of these jobs require a good working knowledge of the Spanish language. It should be noted that jobs in the civil service such as teachers and jobs in the police force are reserved for Spanish nationals. If you have qualifications as a teacher, in Benidorm you won’t be able to teach in Spanish schools but you can at the Costa Blanca International College in Benidorm or at the Lady Elizabeth Schools in Javea and LLiber, or at Xabia International College. Alternatively of course if you don’t fancy working for someone in Benidorm there is always the possibility of going the self-employed route, by setting up your own business in Benidorm. It is important to take note that you will need to pay at least three hundred Euros monthly in compulsory social security contributions as well as VAT or IVA which is due from the first Euro and on every Euro you earn. IVA stands currently at 16% but is due to go to 18% from the first of July 2010. You have to come to Spain with good starting capital to be able to make a go of it. Alternatively of course you can always buy an already established business in Benidorm which can be easier on your nerves and wallet in the long run. Many jobs that are really popular with English people are in the real estate sector. Second to the tourist industry jobs, jobs in the construction industry have been the driving force in the Spanish economy over the last decade and of course there are many real estate agencies in Benidorm selling houses, apartments, villas, fincas, guest houses, hotels etc. There are almost as many real estate offices in Benidorm as there are bars and restaurants. Of course branching off real estate are the tradesmen associated with housing such as plumbers, electricians, plasterers, tillers, painters etc. These jobs are probably amongst the most highest possible earnings and best paying jobs in Benidorm. Popular self-employed businesses in Benidorm are specialty English shops and villa maintenance companies, villa rental and apartment rental agencies. As there are so many villas and apartments in Benidorm being rented by owners and companies, so there are many companies (and therefore jobs) to supply services to service the properties such as gardening services, pool cleaning services and even just general care and maintenance. So when it comes to getting work in Benidorm, the possibilities are endless whether self-employed or employed, even a little translating services will do just fine. Most Benidorm jobs and positions will be in the tourist industry although mostly of a seasonal and part-time nature, these include promoting for bars and nightclubs, dancers, hotel work, club promotors and reps, catering jobs such as chefs and cooks, singers, bands, comedians, waiters, waitresses, airport jobs, villa rental jobs, tour and travel reps, blanket tour sales reps, car hire jobs and cleaning jobs. There will be some related driving jobs in Benidorm such as coach driving jobs and driving people to the airport and back as well as related driving jobs such as taxi jobs and HGV jobs. Other job vacancies in Benidorm for English speakers will be in the property market industry in the areas where expats live although currently this market is very depressed with the recession. This includes sales positions which are almost always commission based as well as jobs for people in property maintenance companies – in other words construction jobs and building jobs for English speaking people. Other typical jobs you are likely to find would be those that cater to the large expat population in Benidorm and the surrounding area, these include: cleaning swimming pools, gardening jobs, villa cleaning jobs, bar jobs and bar work for barmen and barmaids, hairdressing jobs, shop and retail work in English goods shops, taxi service, driving jobs including removals, restaurant jobs such as chefs, waiters and waitresses, fitness jobs, beautician jobs, pet care jobs, computer services, business services such as graphic design, computer repair, insurance sales positions, customer service jobs, there are many English newspaper and magazines requiring writers and sales people etc.. There are few management jobs in Benidorm, few marketing jobs, legal jobs, education jobs, media jobs, office jobs or executive jobs for professional people although there are some secretarial and administrative positions working for companies such as legal and financial companies. You also won’t find many care or nursing jobs available in Benidorm. Anyone searching for vacancies and I.T. jobs in Benidorm (IT stands for information technology) also will find very few opportunties available. One very popular way of finding work and jobs is to consider working as a holiday rep. This is because many tourists visit Benidorm on what is known as package holidays. This involves booking a holiday with a major tour operator such as Thomsons or First Choice. Holidaymakers pay a fixed price which includes a number of different components such as flights, hotels, food and airport transfers. on hand in a hotel in Benidorm is a holiday rep or representative who is there to deal with any problems, questions and the arranging of excursions and tours. A very demanding job energy-wise being a rep in Benidorm best suits people who are looking for a bit of excitement rather than a career. Construction and building jobs in Benidorm are highly possible because of the large expat population in Benidorm who need tradesmen who can speak English. If you are a tradesmen such as a builder, electrician, plumber, painter, tiler, plasterer, bricklayer, labourer or another construction type tradesman then you are likely to find jobs in Spain although wages are fairly low at about €80-€130 a day. For a full index of pages see our main work/jobs in Spain page. Hi Chloe, with your employment background I would look at jobs in Gibraltar as you’d have more options. Hola! I am moving to Finestrat within the next month – set for a life in Spain. I have enjoyed 25 years in a Corporate career, largely Foodservice & Pharma. I have owned a wine bar in Bath, lived and worked in India, New York, Ireland, and since 2002 I have been converting a barn in South West France, alongside working. Proud of my MBA, degrees in Business, Finance & Marketing, also years as a relationship counsellor, I wish to continue contributing to the working world. My energy is said to be contagious, unwavering work ethic renonwned, and my commercial acumen delivers results. All this said, I’m happy to pull a pint, clean a villa, tend to gardens. Are there any agencies I can register with? Hell, my name is Lou. I like to work and live in Benidorm or neighbourhood. At home I make good meals and love to work in the garden, so that could be 2 jobs I like to do. Also working in a hotel or pub would be nice. As a waiter/barman/ gardener. Serving breakfast, doorman etc. My english and german is very good. I am from the netherlands and also speak a bit french. Unfortunately no spanish. YOU MUST SPEAK SPANISH. No matter what you wish to do, ie work for an English business, or one whom deals with English people. You’re in Spain, you NEED to speak Spainish!! You need to order food, drink, give directions to the taxi driver, deal with police, hospital, dentist, and what about getting the Electric bill sorted, and water, council tax, and how about getting the phone and broadband connected?? and then, what about when it goes wrong ect. You’re in Spain, it’s not for them to speak English, but you to speak their language. HI my name is Conor, I am 25 and currently looking for bar work in Benidorm. I have 7 years of experience in hospitality, working in restaurants, pubs, bars, clubs, sports bars and high end cocktail bars. I am living in Benidorm currently and available to start work immediately. Hi I’m Paul,I’m 51 and i currently work in IT but have experience in aviation (12 years as specialist aircrew) and lots of retail experience. Myself and my new partner (she’s a nurse) are looking for a new life in Benidorm that will take us through to retirement age. I’m currently learning Spanish but it’s early days. We’ll both turn our hand to anything and we’re not afraid of hard work. If anyone knows of or requires staff with our skill sets/experience please let me know. My name is Nico, but everyone calls me Nixx, I worked a number of years as a radio DJ in Belgium and I am now going on a adventure with my motor bike thru Spain meeting and filming people ( 30, 40’s and plus ) looking for intersting people to interview for a special you tube channel about these holiday makers. Because I am not rich, I am looking for all sorts of interesting jobs, DJ, waiter, bar help or general bar help. I am also a beer expert, Belgian beers mostly bud also foreign beers, so I have a lot of knowledge about beer. The goal is to meet and video this generation of people in the lifestyle having fun finding out where they came from, what they expect in life or what they want to get out of life in general. I want to film the 30 and 40’s party scene to show that life only begins at this age and is far from over. So if you want to help me and in the process and make your business infamous !!!! Just contact me and leave a note. Hi I’m Ann 46yrs old looking to move to benidorm later in the year 2018, I have been in the casino industry for nearly 20yrs now, working 5yrs for princess cruises as a cashier/croupier. looking for similar work, look forward to hearing form you. Hi I’m 23 and I looking for job as cleaner, waitress, or help in kitchen. I’m Polish, I know English very well and basic Spanish. Hello, I’m 36 from Bulgaria. I have 1 year old daugther. I looking for a job as a receptionist. My job now is administrative- Archives State Agency at the Council of Ministers. Education – master “Cultural Tourism” , bachelor – “History”. I know ENGLISH: excellent and CHINESE: good. 50 year old. In the caravan industry for years. Looking to relocate to Spain. Doing the same thing. I have a young daughter n partner is like to take too. Want to start living life instead of existing. Hi, me and my partner are eager to begin a new life out in Spain, or at least give it a good go! I am 21 and he is 24, I am a business management graduate with experience in retail, sales, customer service and consultancy. He is a plumber working on new builds with many years of experience. Neither of us have any commitments at home and are ready to work straight away. We are happy to do any type of jobs to get our foot in the door and allow us to improve our Spanish language skills! Me and my family would really love to live in Benidorm I have been in manufacturing for the last 33 years making sos bags and paper sacks dose any body know if there’s any companies in Benidorm making this product ??? ?